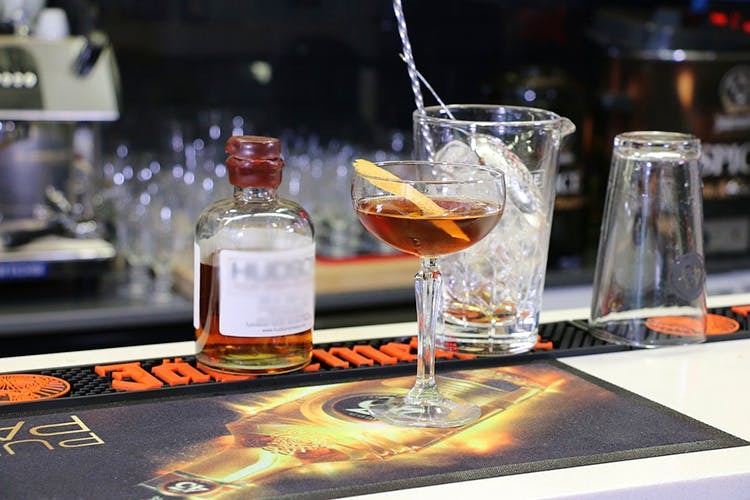 Originally from Pune, and now in Bangalore, Agent Jack’s Bar is now on 100 Feet Road, Indiranagar. A very interesting format wherein you can actually bargain and negotiate prices, this chain of bars has an app. So, let the bidding begin! The menu has everything from beer and whiskey to cocktails and even champagne. The whole idea is that you can negotiate for a drink, from a virtual bartender — Agent Jack. He may or may not accept your bid, but his comebacks are hilarious. It’s some serious bidding, and you best be careful. There’s a massive projector in the pub, so be aware, everyone will know when he’s mocking your price! In addition to alcohol, mixers are also part of the bargain, with soda coming for just INR 1. Whiskey ranges from INR 78 to INR 250, depending on what brand you pick. And INR 450 for premium stuff. Rum, vodka, and gin start at INR 40. Plus, cocktails starting at INR 250. Oh, and beer and Breezers, starting at INR 70. Food includes bar nibbles like peanuts, nachos, French fries and onion rings. There is also a range of appetisers from Cheese Balls and Lemon Grass Paprika Prawns to Black Pepper Mushroom and BBQ Wings. Mains include tandoori specials, pizzas, burgers, pasta and grills. If you’re looking for a quick fix, they have East Asian and Indian curry combos to pick from.